A full-scale mock-up of VRT500, a new utility light helicopter being developed by Russian Helicopters Holding, was made public for the first time today (May 24) during on-going HeliRussia 2018 exhibition in Moscow. The VRT500, Russia’s foray into what is projected to be the most mass production helicopter category in the near future, is a light, five-seat, single-engined coaxial rotor helicopter with a take-off weight of 1,600 kilos. It is projected to be capable of lifting 730 kilos of payload over 860 kilometres at a speed of 250 kph. The rotorcraft will be available in passenger, multi-role, cargo, training, VIP and medevac versions. Russian Helicopters claims that the VRT500 will be world’s first less-than-two-tonnes helicopter able to load/off load stretchers via clamshell back doors. The project is Russian Helicopters’ first venture in this class. The new helicopter is being jointly developed by VR-Technologies, a design bureau which is part of the holding, and in cooperation with “a team of international engineers”. 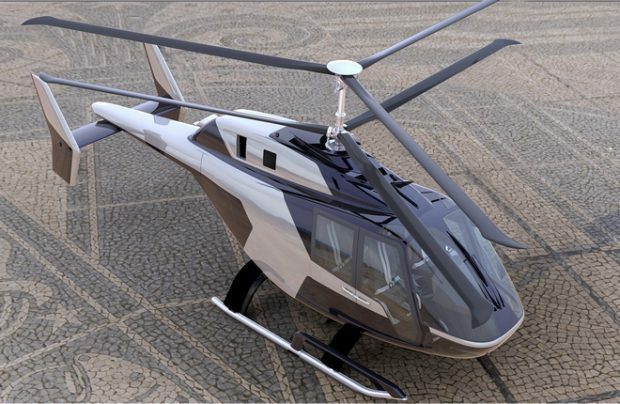 The high performance capabilities of the new helicopter will go hand in hand with an attractive price and maintenance cost package, while its cabin will be the largest in the class, reveals Alexander Okhonko, director general of VR-Technologies. All these features will eventually allow the VRT500 to grab up to 15 per cent of the global market share of commercial helicopters with a gross weight of less than two tonnes. “We expect there will be about 1,000 units produced and delivered by the year 2035,” Okhonko adds. Currently, the main rotor system of the new project is undergoing structural tests, the company says. Wind tunnel tests are to follow shortly with the first prototype scheduled for completion by the end of 2019. According to Andrey Boginsky, general director of Russian Helicopters, the new VRT500 is expected to perform its maiden flight in 2019. “So we expect to launch the commercial production in 2021 at the Ulan-Ude assembly site. We count very much on this project as we are developing the rotorcraft in cooperation with our European partners and we sense it has a great export potential,” he adds. The new Russian helicopter will compete with foreign models in the less-than-two-tonnes market, such as Robinson Helicopters and Bell.